Simon McNamara, marking his fourth year as Director General of ERA highlighted his satisfaction that the association’s membership has weathered the continued turbulence in the industry, adapted and emerged stronger. The Directorate has certainly played a significant role in defending the industry – making 110 visits to regulators, members and industry associations so far this year. Passenger growth was up 3.2% last year. Four new airlines joined ERA this year boosting the total to 54. A quarter of the world’s top regional airlines are from Europe and ERA has just been buoyed by the return of one of the biggest – Paul Simmons, Chief Commercial Officer of Flybe, but now off to Malaysia, literally making a flying visit to say goodbye to his friends in the industry. Collectively the regional airlines of Europe operate 629 passenger aircraft, fly 45m annually (1,200 routes point to point). By adding in airports, manufacturers and suppliers, ERA generates 280,000 direct and indirect jobs, contributing €47bn to Europe’s GDP. The large airline alliances hold 54% of the market in Europe. The balance is largely ERA. “We see ourselves as the voice of the piranha fish – fighting for our territory,” noted Simon. ERA airlines can applaud themselves for being masters of reinvention and this was evidenced in Berlin. First up Pat Byrne, newly reinstalled as Executive Chairman of CityJet, the Irish airline he created 22 years ago in Dublin, marking his return by announcing his airline is phasing out the Avro RJs in favour of the Sukhoi SuperJet narrowbody SSJ100s. (See BTN 19 October) The deal for 15 aircraft includes 10 options. Describing the arrangement with SuperJet as a preliminary agreement, he said that this aircraft is going to be the one to watch and our peers will be watching us. 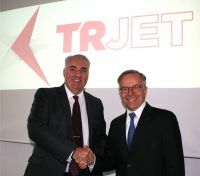 The aircraft will be leased, but CityJet is not disclosing the source. “We’ve seen how well InterJet in Mexico has got on with the aircraft,” Pat said, noting the Snecma/Saffron/SaM146 engines were key in the decision-making process. He made a second appearance with Bombardier the following day to express confidence in the CRJ900 as the perfect replacement aircraft for Blue1’s elderly B717s. CityJet was the successful bidder (from 11 candidates) for SAS’s wet lease charter work and in early October emerged as the victor to take over the Finnish regional carrier, based out of Helsinki. Also returning to ERA was 328 Support Services GmbH, the type certificate holder of the Dornier 328 jet and turboprop and now under new ownership as the European subsidiary of the USA’s Sierra Nevada Corp. An MoU was signed between 328 and Pratt & Whitney Canada which will start production of the PW306 turbofan engines to support the new TRJet regional jet programme, originally announced at the Paris Air Show this year. The aircraft will be built in Ankara by Turkish aviation companies, supported by 328’s engineers with the original Dornier legacy. Dave Jackson, Managing Director of 328, said that the slated service entry for the TRJ328 is for the end of 2017/early 2018. He acknowledged 328 is putting up four existing 328 airframes – three jets and one turboprop for various testing – one for engines, one for the cockpit, one of obsolescent parts and a fourth, in reserve. 328 is anticipating a market for 250 aircraft over the next few years – 200 turboprops and 50 jets, he said, highlighting it was especially good to talk to ERA airlines where we are seeing some early interest. ATR apart, which boasts a full order book, there is nothing new in the sub 50-seat category as a natural replacement for the 30 seater. Types like the Saab 340 and Jetstream 41 are getting old, but airlines are still flying them. With the RUAG Dornier 22NG back on the scene (Aurigny will receive their brand new aircraft as its Trislander replacement in December) and with Viking Aircraft of Canada promoting the Twin Otter 400, the turboprop is very much back in vogue. ERA’s fleet today is made up of 46% turboprop and 54% jet aircraft. Bombardier took the opportunity to say it is 100% committed to the C Series, but had no further comment on its now shelved talks with Airbus. Ross Mitchell, VP Business Acquisition, said the aircraft was entering the final stage of flight testing and is on track to certify the aircraft by year end paving the way for delivery to launch customer Swiss. It holds 603 commitments for the aircraft, he said, 243 of which are firm orders. Mitsubishi said after the show that the first flight of its new regional jet had been delayed at least two weeks. Hideyuki Tamiya, Head of Strategic Marketing, confirmed the aircraft, one of five in the test programme, will fly for one hour from its Nagoya Airport base. 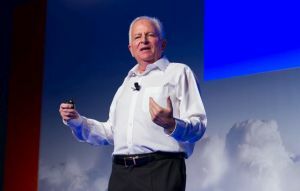 This year’s inspirational speaker was Larry Hochman, US-born European Speaker of the Year. He had some advice for delegates about how they should value their company’s brand in the digital tsunami. Airline stories are more emotive than any other industry in the world, he said – citing 9/11, Lockerbie, MH117 and MH370. Socially people are obsessed with airline stories. How was your flight, what happened, baggage delays, etc. In the social media world complaints have to be dealt with in real time – you can’t wait three days. Social media should not be just about selling either, he said, highlighting to delegates that peer recommendations (for new business) still account for 70% of wins, marketing just 10% when it comes to influencing customers. He praised those airline companies that have changed, because being adaptable is the key to survival. Intelligence is no longer a competitive advantage, he opined, highlighting that Ryanair is no longer punishing us – they are focused on service now, following easyJet’s lead. Hochman’s advice to parents: travel is the richest experience to have – that is how you get empathy and understand different cultures. 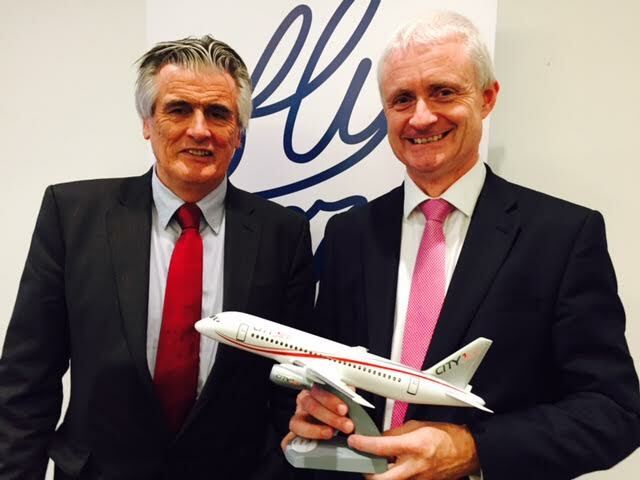 At the ERA’s 2015 airline awards, Gold went to ASL Airlines Ireland (formerly Air Contractors) of Dublin; Silver to Aurigny Air Services and Bronze to Air Nostrum. Judges heralded ASL for its expansion into ACMI passenger operations under its own brand highlighting its support to Ryanair and Aer Lingus specifically. ASL Airlines is the new umbrella grouping for three other airlines – Europe Airport, Farnair Switzerland and Farnair Hungary, each of which retain its own AOCs. Aurigny Air Services, 47 years old, won praise for launching jet services with the Embraer 195 last year and its commitment to improving the connectivity of the Channel Islands, including an important new link to London City Airport from Guernsey. The new service is now attracting 15% transfer traffic with passengers flying on to destinations in Germany, the Netherlands and Switzerland. It is forecast to carry 350,000 passengers through the three London airports – Gatwick, City and Stansted this year, CEO Mark Darby said. Air Nostrum’s management were praised for successfully implementing a recovery plan, attracting €25m of new capital, winning new PSO contracts and returning the company to profitability. In a break from tradition ERA awarded two individuals its Personal Excellence award. 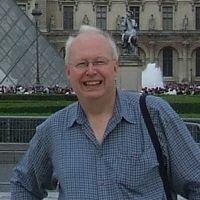 The first went to Klaus Knopfle, Vice Chair of ERA's Industry Group and the second to Low Fare and Regional Airlines Editor Bernie Baldwin, 27 years writing about airlines. "Bernie is a great example of how the media can work with the industry", said Simon McNamara. ON THE SOAPBOX, our first issue of the month, highlighted next week, will feature Simon McNamara on “The Regional Revival”.